Friday is typically my rest day so no running. I’ve mentioned in previous posts that I’m a part of an online Healthy Moms group that is a spin off from a moms group started during my first pregnancy (2+ years ago!). I’ve gotten to know quite a few women in the group–hi Salt!–and have been able meet quite a few in person. I got to add to that list by meeting a mom visiting Arizona. Julia is from Las Vegas and is also a runner. A pretty speedy one too. 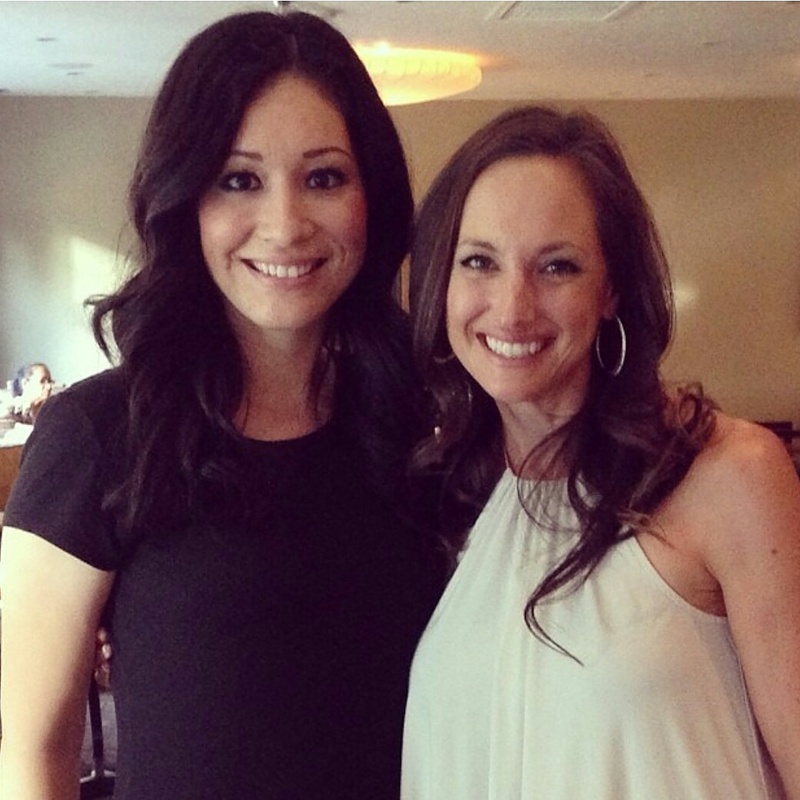 She just recently started a running blog called Vegas Mother Runner–check her out! Sunday was filled with house cleaning and organizing. We finally put up our medals–yay! Overall, a pretty relaxed weekend. I feel really rested and looking forward to getting a run in tomorrow and prepare for my first night trail race on Saturday! –How was your weekend? Did you run/race? –Where do you hang your medals? “meet” the people we have been friends with for so long online!! 🙂 I love to shop, but do most of it these days online! 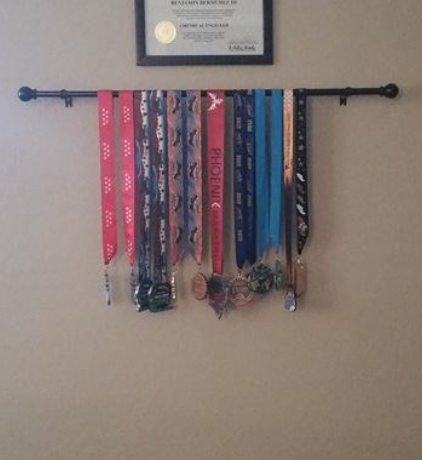 Your medal display looks great! Oh YES I am a shopper as you well know. 🙂 I am so jealous you girls got together!!! I’m totally photoshopping myself in. And I love your medal display! Mine are hanging in the bedroom, but I kind of want to move them someplace else and I need a shelf too because some of the stuff I have isn’t hang-able. I am such a shopper! It is, without a doubt, one of my biggest weaknesses! Love a guy who can admit this!! I love the brag wall! So many pretty medals! I found a magical yardsale where designer clothes were being sold for $.50 -dresses for $1. So, yes, I WENT SHOPPING LOL I feel like I got a whole new summer wardrobe for $30 total. I love rich people who can shop for me! I hang my medals at work. I figure its where I spend most of my time so why not. Jaja!! Right?! It doesn’t matter what I shop for, I love it! lol! 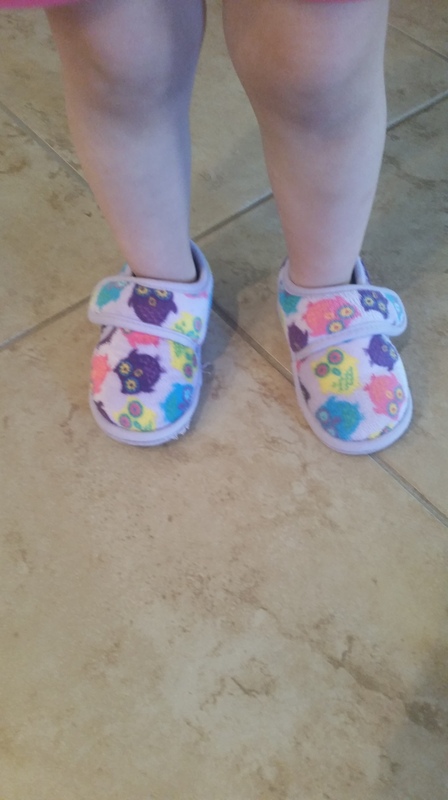 Love the little owl slippers! We hang our medals on the stairwell into the basement. It’s unfinished but houses our home gym. Sometimes they seriously give me the inspiration I need to work out! I love owls too! Hope you’re all recovered from being sick. Yey for your medal holder!! I have a Moms RUN This Town medal holder that I was given for our first anniversary! ← And We Have a Bondi Band Winner….Two Of Em!